Broken objects. The Kabalah, the Jewish mystics, teach us that we are all broken objects. 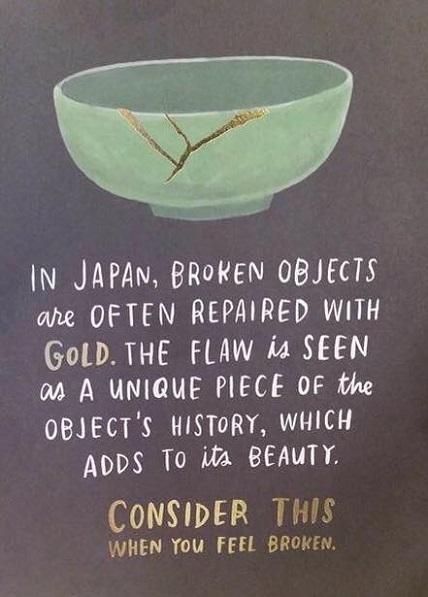 I recently saw this "In Japan, broken objects are often repaired with Gold. The flaw is seen as a unique piece of the objects history, which add to its beauty. Consider this when you feel broken." We all feel broken now and then. I just returned from Ukraine where people still fix things themselves. I recall as a child there were all sorts of repair shops, for shoes, watches etc and little by little they disappeared. Everything became disposable, nothing was meant to last and many times I was told "It simply does not pay to fix it, buy a new one." As one recently divorced woman told me, "spouses are also disposable objects, no one wants to work on anything. Just get a new one. With the arrival of more immigrants from the former Soviet Union we saw men who can fix things, anything. Soon little shops began to appear again in our town. Now I can have my shoes repaired, my belt, my watch, anything. Why? Because these men were raised in a time and place where people needed to fix their own things. They could not afford to simply go out and buy a new one." We complain about economic hardships but yet other people, Bedouin Arabs, search our garbage for discarded items. Our garbage is their treasure. They find incredible ways to use it. What do we do when something breaks? We curse, we shout and then we get a broom, sweep it up and throw it away. But now we have thrown away part of ourselves, part of our personal history. Everything in life is broken. We all break now and then. And then we are encouraged to move forward, put it behind us, leave the past in the past. But yet, we must not. The broken piece is still a part of us. It helps us grow to become better people, if we apply the lessons correctly. Our pain is part of our personality, both our failures and our successes shape who we are. I know a rabbi who had a dream to build a great academy where anyone was welcome to come and study. Twice he built great schools but due to differences of opinions he was forced out. He was forced out of the very schools that he founded. He did not give up. Today the school that he founded occupies the greatest piece of real estate in the world, a huge complex facing the Western Wall of our broken holy temple. How perfect. And yet this man built an empire and left this world having benefited so many. We must never give up. A broken object will never look like a new one, but it can be beautiful. We must see it as beautiful, repair it with gold and with love. Let us not sweep it up and throw in the garbage. We are told that the tablets of the ten commandments, the first set that Moses shattered, were kept in the holy temple. This is to remind us that holy objects are never thrown away. And what applies to objects applies to people. We are taught, why were the original tablets preserved in the holy temple? To teach us that a rabbi, a scholar who became old and senile is still to be respected as he was in his prime.